MaddenCo’s beginnings date back to the late 1970s, when Greg Madden, fresh out of college, was offering his programming knowledge to all types of businesses looking for custom software packages. One of those businesses looking for such services was Raben Tire Co. in Evansville, Indiana. Greg wrote a package for Raben Tire, which remains a MaddenCo customer to this day, and word quickly spread throughout the tire industry of Greg’s ability to write a software package for tire dealers. Greg continued programming in the industry on a mostly regional level, until the mid 1980s when Tire Centers, Inc. (TCi) of Duncan, South Carolina signed on to use the Tire Dealer System. With TCi using the software, MaddenCo could point to a national brand that was using its system, which opened doors in all parts of the country. From these roots, MaddenCo has blossomed into the industry leader that it is today, with nearly 260 dealers and 2,700 locations currently using its software. Today, MaddenCo continues as a closely held, family-owned corporation with day-to-day management in the hands of Jay Adams (President) and Kim Poynter (CEO). MaddenCo’s Tire Dealer System has evolved over the years. 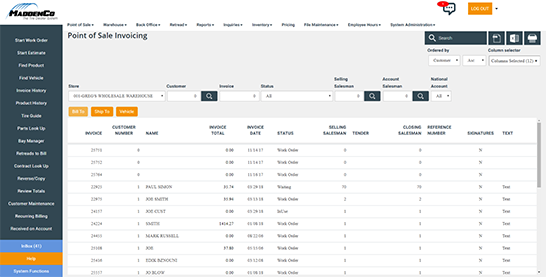 Today, the Tire Dealer System is an integrated (accounts payable and general ledger) software package for independent tire dealers and truck stop service centers. MaddenCo’s Tire Dealer System is used throughout all segments of the tire industry, from the single location retail outlet, to the multi-store corporation that has retail, wholesale and commercial operations, along with retreading facilities. Further, several years ago, MaddenCo recognized the overlap between the needs of truck stop service centers and independent tire dealers, and began marketing its solution to the service center industry. Quickly seizing this opportunity, MaddenCo is now in over 500 truck stop service centers across the country and provides the same functionality and support to both industries.